Time for a change - clock makeover - Lovely Etc. Apparently there was a time, (perhaps the 70s? ), when a nice ornate clock/candlestick combo was very in vogue. The first time I saw one of these at a yard sale, I thought it was unique. But since then I have come across several more. Quite the intriguing design statement. I especially love the fact the candleholders are attached to the clocks with chains. The first thing to go were the chains and candleholders. I debated keeping these tired ladies as clocks, but decided they really were begging to be made into mirrors. I cleaned them up, spray-painted them, and replaced the clock parts and clock face with mirrors. Now these gaudy old clocks are fresh, lovely, and ready for 2011. I will definitely keep my eyes peeled for more of these potential lovelies. Now I just need to think of a great use for some vintage clock faces – any thoughts? 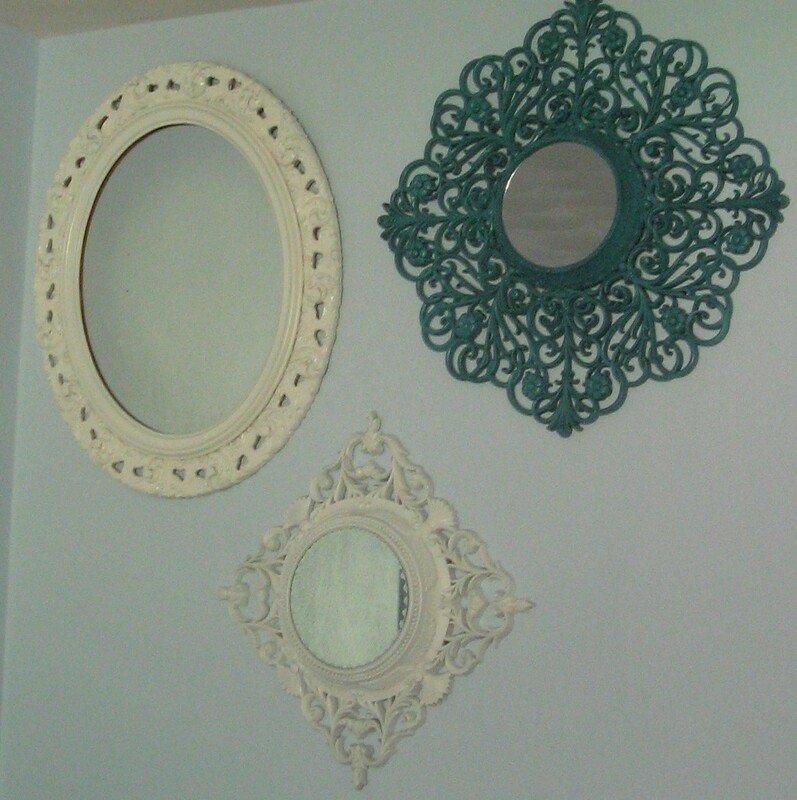 What an inspired idea–they look fabulous as mirrors! I’m your newest follower. Love! Absolutely love this idea! It turned out so cute. WOW! What a great idea. Super creative. I’d love if you would join us over at Sew Woodsy and link this project up! Gorgeous & clever! My dad still has that exact clock (the larger one) hanging on his wall. Wonder if I can sneak it away…tehe…. I think it is superb!! Pinning it. Those are awesome!!! Love them! So very pretty and creative! I love them as mirrors! What a fantastic idea! I so want to try this one! The clock faces you could sell on ebay as parts for steam punk accessories. Or make said accessories. You turned them into lovely mirrors, well done! This is so cool! I wouldn’t have ever thought to do something like this, now I will have to keep my eye out for a clock. I featured this on my Friday 5! Wow! These are super duper fabulous! Thanks for linking up at Mod Mix Monday! Those look wonderful! I really like them. Congrats for being able to see past the ugly of those clocks! I like your makeover so much that I featured it in my weekly “Metamorphosis Monday” post today. 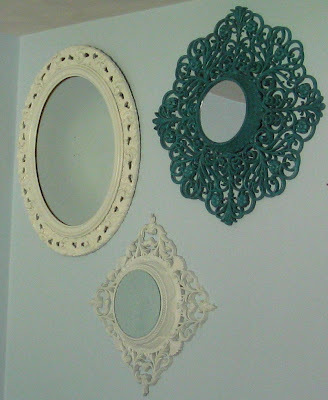 I featured your pretty mirrors today over at Mod Mix Monday! Just found your blog through ModVintageLife and I’m so happy I did. Love how you transformed those ugly once was clocks to the beauty they should have been! I’ve found some old mirrors some ornate and created my own mirror wall also. Love this idea! So cute! Where did you get the mirrors?